Silk Satin Peacock Wedding Robe Bride Dressing Gown white with pink writing. Only worn for a couple of hours for photographs. Really pretty and lightweight so not too warm for getting ready for a summer wedding! I'm not sure if it had a belt but I can't find it if it did - they look lovely just worn open though. There are a few loose threads around the stitching near the neck and one at the pocket. I've included them in the photos - they can just be trimmed but just wanted to show them. I can't see a size on it but it will have been an XL size 18/20. 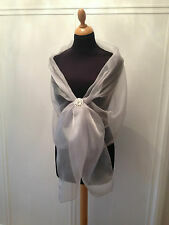 YOU ARE PURCHASING A BEAUTIFUL ORGANZA WRAP. Free swatches are available on request to avoid ordering the wrong colour. 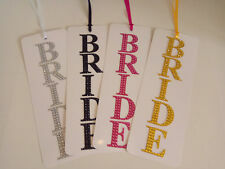 Choice of 4 colours for DIAMANTE BRIDE, Pink, Gold, Black or Silver. Choice of card colour White, Rose Gold, black, silver, red, turquoise, purple, blue or baby pink. We strive for quality products and promise to try our best to resolve all problems. GREAT ITEM FOR WEDDING/PARTY DRESS AND OTHER PROJECT TOP QUALITY RHINESTONE STARS APPLIQUE CHINE, TO GIVE YOU THE BEST SHINE. IT WILL GIVE YOU REALLY SHINE. HAND SEW AND CAN BE GLUED. WIDTH: (3.5CM) APPROX. Quality Padded Pair of White Fluffy Open Toe Spa Slippers Gorgeously Stitched with Padded Gold Script 'The Bride' Logo. A Perfect Gift for the Bride on Her Hen Do, Bridal Party, Honeymoon or Spa Weekend. Features: 100% brand new and high quality A set of 1pcs Elegant Handmade Bridal Belt Ideal for casual, household, party, birthday, etc. Description: Exquisite & high quality Bridal sash The APPLIQUE is approximately 18.11" long and 0.99" wide (widest point). Total Length of ribbon belt is 118.11“(3m). Belt Color: Light Cream Package includes: 1x Bridal Sash. Matching bridesmaid dress bags can be made to match. these are extra large images. Hand painted dress bags. •hair colour & style. •eye colour. Made with crystal rhinestones on soft double sided satin, angle cut and sealed at the ends to prevent fraying. Can be tied in a bow in the back of the gown or altered to your gown to be worn as a bridal belt. Not only as a decoration to make a bright spot for a wedding or evening dress, but also can help liven up your outfit. Perfect for brides,bridal parties,and any other formal occasion. You\'ll become the center of attention and everyone witnesses the most beautiful moments of your life. Material Cuprum;ABS plastic; Brass Color As picture shown Overall Size 2cm x 275cm Rhinestone Size 2.5cm x 45cm Designer/Brand Unbranded Brand Unbranded/Generic MPN HD786862880072 EAN 0786862880072. With crystals rhinestone on polyesters sash, which can be tied at the back to adjust for all sizes. - Sash size(L x W): Approx. 1 Piece Sash waist belt. - Color: Silver, Cream White. - Decor size(L x W): Approx. Wedding belts, crystal applique, bridal gown belt. 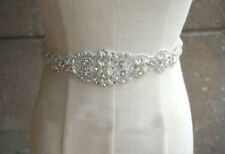 Beautiful Wedding Dress Belt, Rhinestone lace Belt,, Rhinestone applique, crystal sash,Belt. Iron-On, hand stitch, Can be glued. Note: Quantity of 1 is for a piece of 28 cm length x 3.5 cm width. Exquisite & high quality Bridal sash. Satin Color: Ivory. Total Length of Satin ribbon belt is 118. 11 “（3 m）. If you are not happy, we are not happy! Also note that monitor settings may vary from computer to computer and may distort actual colors. PERFECT FOR PATCHWORK, QUILTING, CORSAGE. 20x CLEAR DIAMANTÉ STYLE HAT PINS. BUTTON HOLES, FLOWER DISPLAYS OR EVEN FOR USING IN HATS! Stunning ivory bridal belt. Never used. YOU ARE PURCHASING A BEAUTIFUL CHIFFON WRAP. Free swatches are available on request to avoid ordering the wrong colour. All edges are finished by rolled hem. White robe with Bride printed on the back. Size Medium so most suited for size 10-12. I purchased this for my wedding but my maid of honour surprised me with one so this one was never used. Features: 100% brand new and high quality A set of 1pcs Elegant Handmade Bridal Belt Ideal for casual, household, party, birthday, etc Type:Bridal Belt Color:ivory-white Rhinestones part: length: approx 45 cm;Width: approx 2.5 cm Ribbon part : Length: approx 275cm Material:Rhinestones Satin Ribbon Pearl Note: Please allow 1-3cm (0.4-1. X6 Luxury custom made wedding hanger stickers / graphics. then we will create your perfect graphic, you will receive a proof before your item is dispatched. 【Wristband】. 【Cufflinks & Clip】. 【Children tie】. 【Square 17"-18"】. 【Square 19"-20"】. 【Square 21"-22"】. 【Cushion Cover】. Do not run through your life so fast that you forget not only where you have been, but also where you are.